This is the first in a series for The Toronto Star about first time experiences. Melanie Chambers was never an athlete in school, but cycling was always a constant. “You looked shell-shocked at the start line,” says my boyfriend. 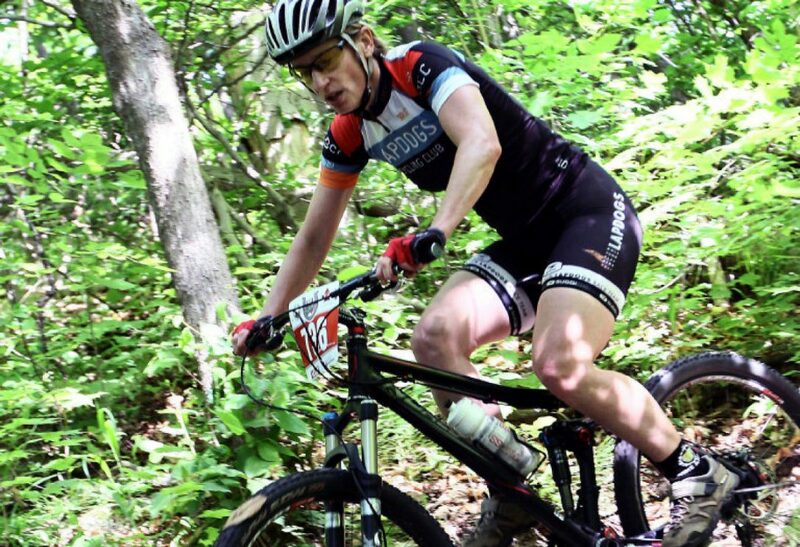 Poised to push off the pedal, all I could think: “What am I doing here?” Never an athlete in school, why did I decide to start mountain bike racing at 42? And while my fellow, more-experienced, riders said they felt the same way, I wanted to bolt home. Countdown begins. Ten. Heart is pounding. Nine. Wow, that woman’s legs look strong. Eight. Friends think you can do this. Seven. I’m old. Six. Can I puke now? Five. Four. Three. Two. Pedal! We’re on a dirt road in Uxbridge, the site of the first Ontario Cup race of the summer series I’ve committed to racing. After 90 minutes of breathlessness, climbing hills too steep to walk comfortably and pinballing between trees on a narrow dirt trail (singletrack), I land in second place. Dancing and giggling, this exhilaration is new to me. “I didn’t want to tell you before because I was afraid it would psych you out, but I knew you could make podium,”my boyfriend says. Wow, and after only one race, I’m starting to believe it. Six more to go. Growing up, I wasn’t into sports; I didn’t have athletic heroes. I’ve never trained, or competed, but cycling and fitness have been a constant in my life: in 1996, biking from Amsterdam to Spain seemed like the most natural way to experience Europe for the first time. Weeks before the race, I bought a lightweight road bike for multi-hour rides, and the occasional days of quad-burning hill sprints. Sprinkle this with more mountain biking and advice from boyfriend Paul, “light on the bars in the climbs,” and my favourite, “suffer well,” I didn’t know my potential, yet. And at the most technical race of the season, the sixth of seven, I would need courage. At 42, I feel ready. But that didn’t diminish the fear. My friend called from the hospital after a practise ride on the legendary “Buck” (Buckwallow Cycling Centre) in Bracebridge. She launched over the handlebars, got stuck between two rocks and sprained her wrist. Cycling Buck is like riding a series of whale backs — only whale backs made of Canadian Shield granite. On the morning of the race, after a spotty sleep, I’m back in the dreaded corral. “Ten seconds … go!” Starting on a rooty dirt road, I’m near the front until the trail funnels into singletrack (a narrow mountain biking trail so narrow that riders must ride single file). A woman in front hits a tree and flies off her bike forcing me to a stop. The pack is gone. Panic grabs my chest: a boulder ahead. I can, I can. Jerking the bike up, the front tire grabs the rock; a couple strong pedal strokes and I’m on top. I’m amazing. Excitement lasts seconds. Gripping the bars over a network of jagged tree roots, I’m too slow and hit the wrong angle; the bike bounces off a root and knocks me off to the side. Steadying my shaking leg back into the pedal clip, I push off but the bike is motionless: the chain is off. Calm down. In seconds it’s on again. Teetering on the ridge of another whale back, then swooping down into a sharp banked corner, the bike goes horizontal, effortlessly swooping into figure eights. Fear is replaced with confidence. And joy! “How did you do?” asks my friend, who skipped this race. “But you finished,” my friend says. It was the toughest race in the series. And I did it.